Description: The building faces north and is a three story limestone structure. 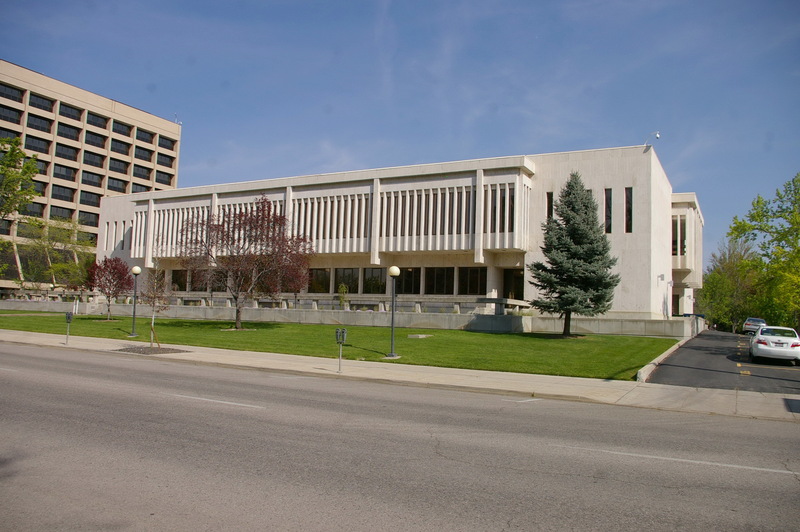 The building is the Idaho Supreme Court Building and is located east of the State Capitol. The main entrance is located on the north side of the building. The walls inside and outside are covered with travertine limestone quarried near Idaho Falls. 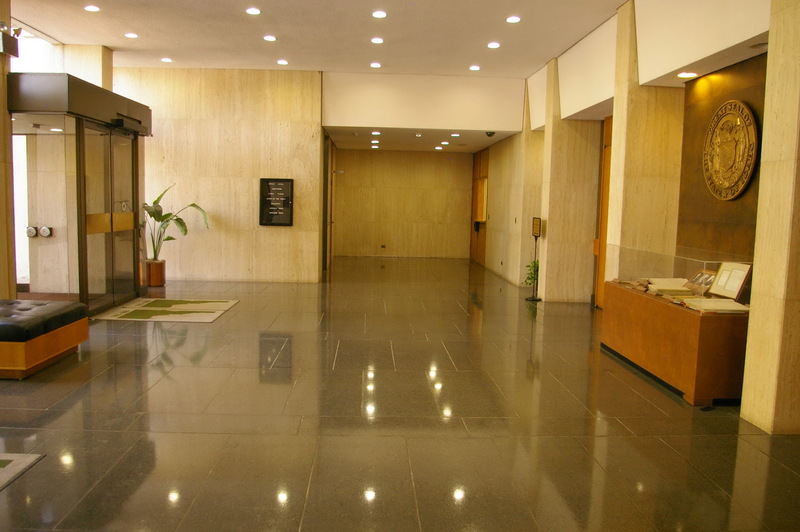 The floors are of granite chip. 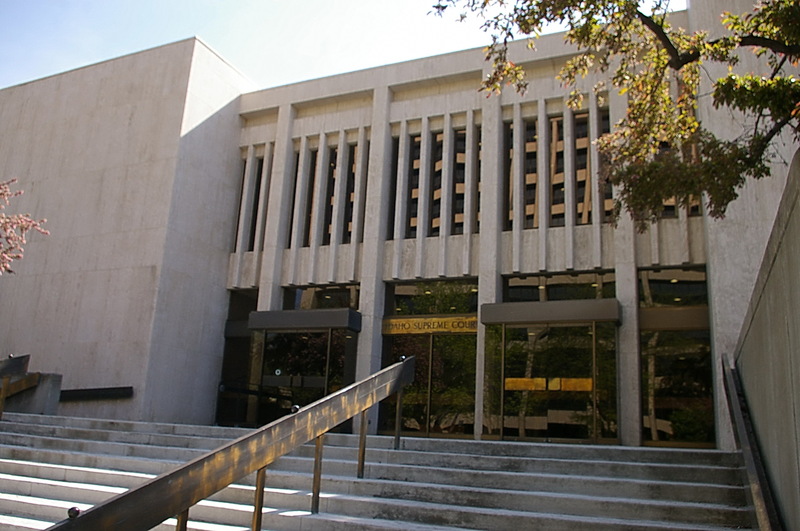 The building also houses the Court of Appeals and the State Law Library. See: The architect Dropping, Kelley, Hosford & La Marche designed the courthouse in Latah County and the Judicial Building in Minidoka County. 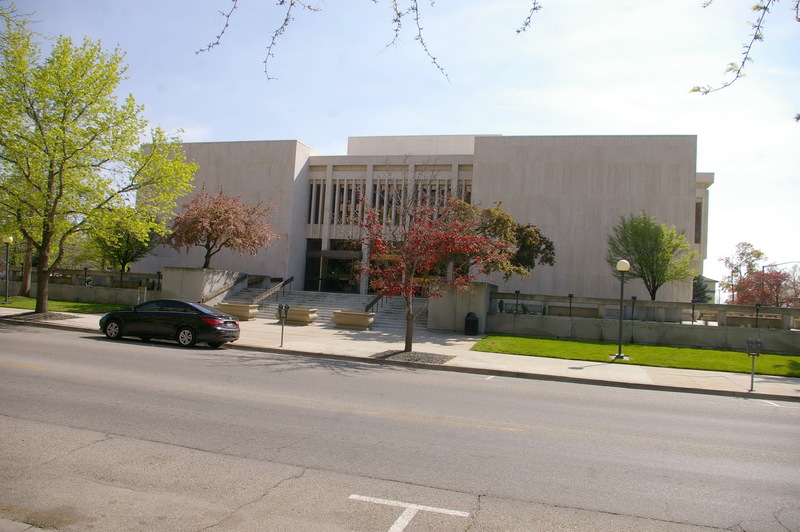 See: The Idaho Supreme Court is located in Ada County. 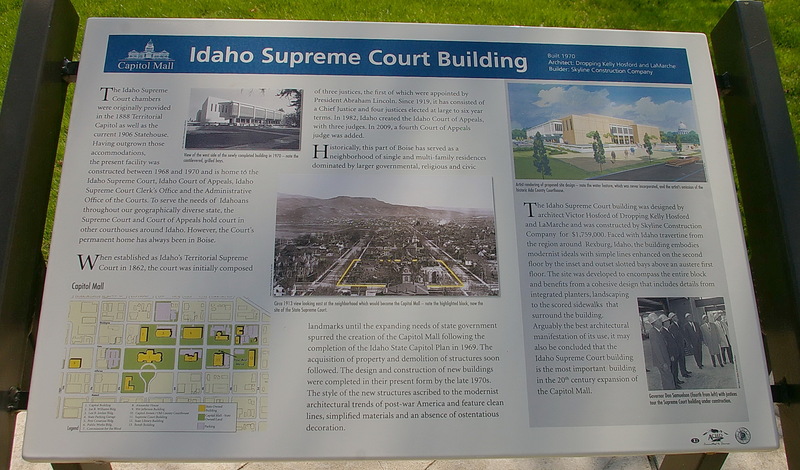 The Idaho Supreme Court Building certainly had a significant impact on the state of Idaho. When Idaho was officially declared a territory in 1863, Abraham Lincoln established Idaho’s Territorial Supreme Court and appointed the original three justices. 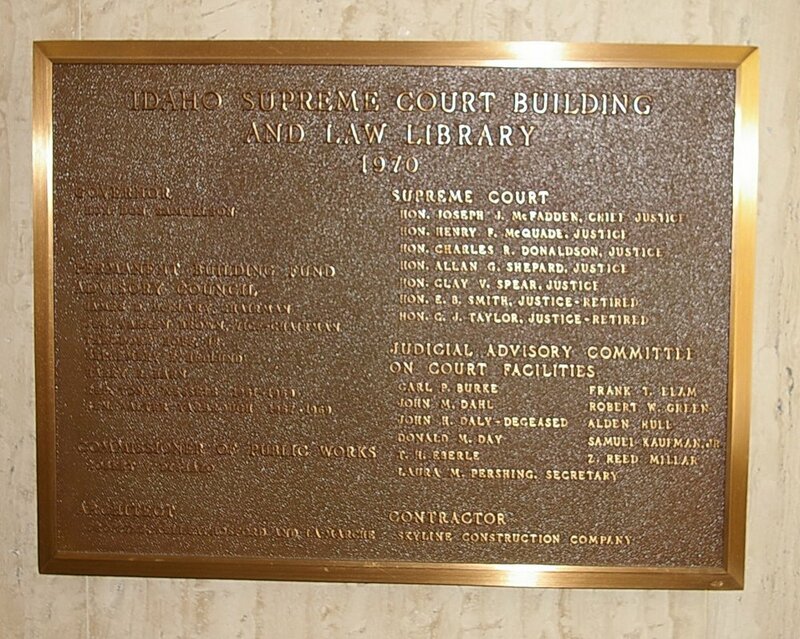 In these early years, the location of the Idaho Supreme Court varied throughout the state. 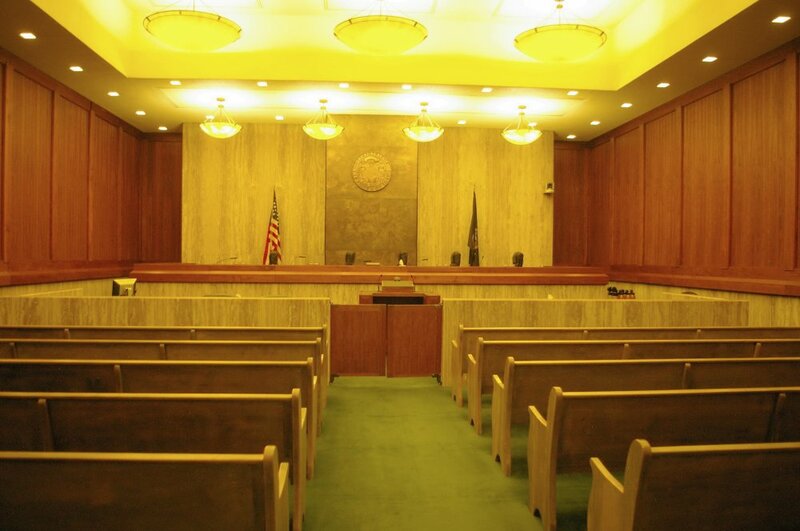 While the court ruled and continues to rule in some regional centers, such as Coeur d’Alene, Moscow, Lewiston, Pocatello, Idaho Falls, and Twin Falls, the permanent home of the court is now in Boise. Originally, court chambers were located in the Territorial Capital building. In 1906, the Idaho Supreme Court began to reside in the current Statehouse in downtown Boise. 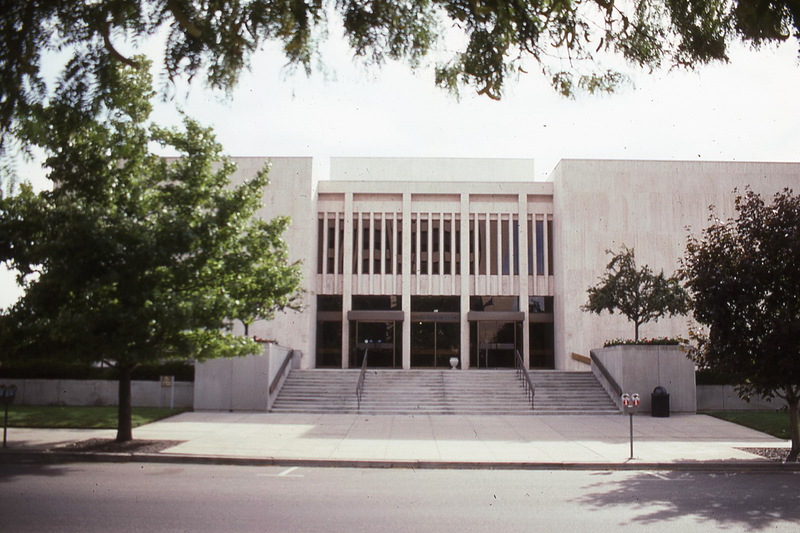 By 1969, the Idaho Supreme Court had drastically outgrown its accommodations, and the present building was constructed, at 451 W. State Street in Boise, ID, in the new Capitol Mall district. 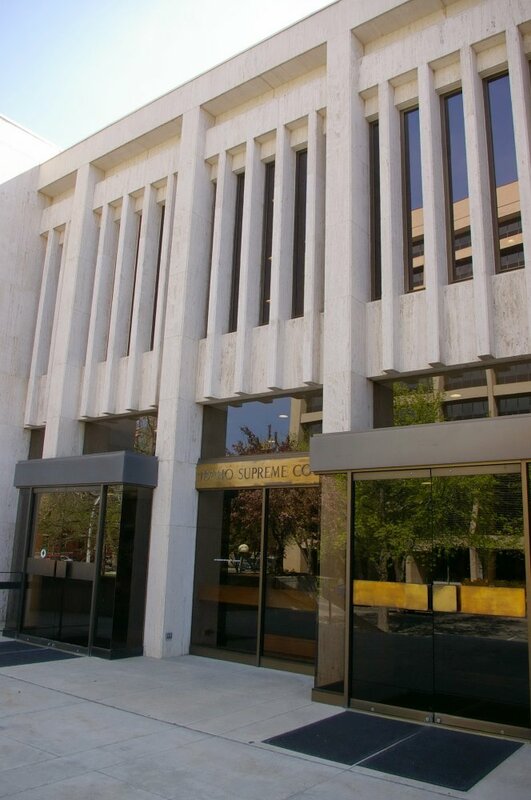 The Supreme Court of Idaho became the State’s court of last resort, with rulings only reversible by the United States Supreme Court. Though the court initially consisted of just three justices, in 1919, the court began to consist of one Chief Justice and four Associate Justices, all serving for six-year terms. 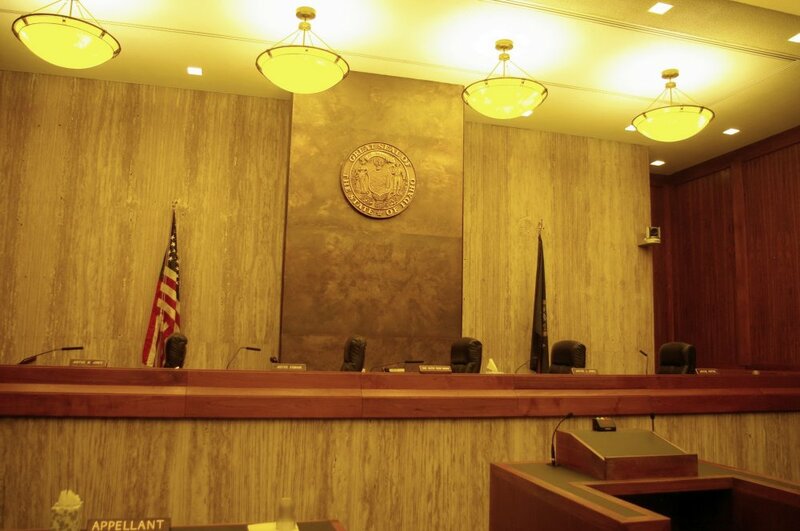 Currently, the Chief Justice of the Idaho Supreme Court is Daniel T. Eismann, while the Associate Justices are Roger S. Burdick, Jim Jones, Warren E. Jones, and Joel D. Horton. This court hears appeals from final decisions of district courts and orders from the Public Utilities Commission and the Industrial Accident Commission. No witnesses or testimonies are heard at this court and there is no jury; the Idaho Supreme Court’s usual task is to regard possibly errors committed by lower courts. 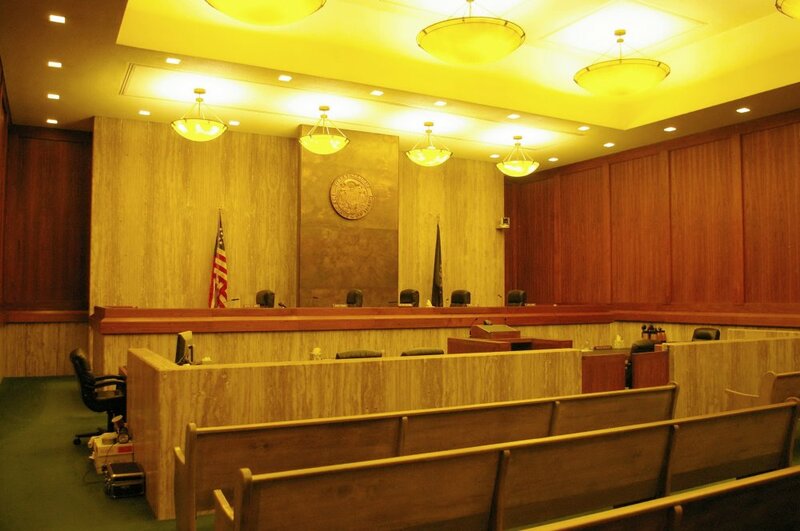 Trials simply consist of attorneys that present information on legal issues. The Idaho Supreme Court can issue writs of review, mandamus, prohibition and habeas corpus, and any other writs necessary. The Supreme Court is responsible for the administration and supervision of the trial courts and the Court of Appeals. The Capitol Mall district used to contain many single-family and multi-family residences, but these residences were always dominated by larger governmental, religious, and civic landmarks in this area of downtown Boise. When the Idaho State Capitol Plan was completed in 1969, the Idaho Supreme Court Building was now planned to be built. 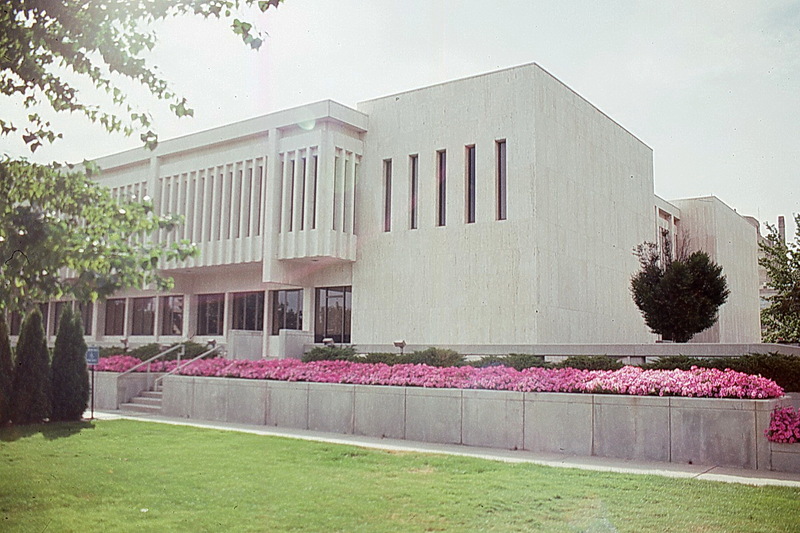 By the late 1970s, acquisition of property, demolition of structures, and the design and construction of the new Capitol Mall buildings were completed in their present form. The Supreme Court building contains Justices’ offices, the courtroom, the Administrative Office of the Courts, the Supreme Court and Court of Appeals Clerk’s Office, and the State Law Library. 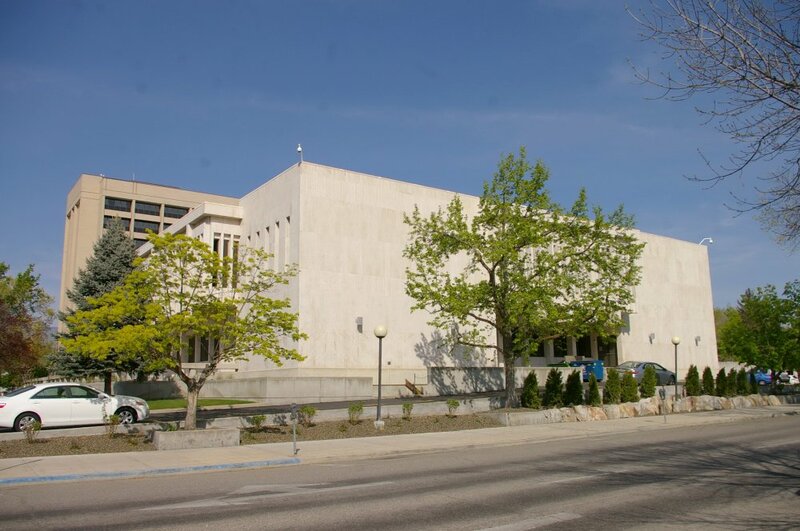 As the Idaho Supreme Court is the highest court in the state of Idaho, it calls for an intimidating building. This was definitely accomplished with the clean lines, tinted windows, and simplified materials that this addition to the Capitol Mall contained. The building itself was designed by Victor Hosford of Dropping Kelly Hosford and LaMarche and constructed by the Skyline Construction Company for $1,759,000. It was intended to encompass the entire block and integral designers created a very simple but clean landscape outside of the building, complete with a small, concrete courtyard. 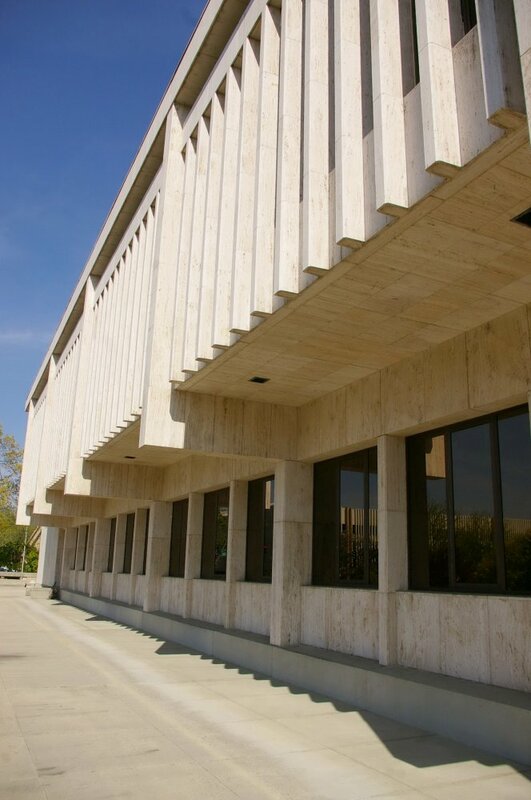 The style elements of the Idaho Supreme Court building are fairly simple. The whole building is pretty square and, therefore, full of sharp angles. There are also arches on the each side of the building created by vertical lines and windows connecting with a single horizontal line. This differs from the traditional Gothic or Romanesque arch because there is no curve to the arch and, instead, the vertical and horizontal lines meet at ninety degree angles. These elements give the building a rather harsh and uninviting look which could be described as Brutalist in style but, because of the lack of geometric shapes, does not fully fit the criteria. The building also exhibits signs of being a part of the Art Deco style because of the extensive use of vertical lines and windows that seek to draw the eye upward. The arches, as previously described, also exemplify the presence of Art Deco because they help draw the eye up while also connecting with a horizontal line which gives the sense of finality in the building. This differs from some other buildings with Art Deco style such as the Chrysler Building because some of the vertical lines end in a rounded arch rather than a sharp, abrupt end as seen in the Supreme Court building. 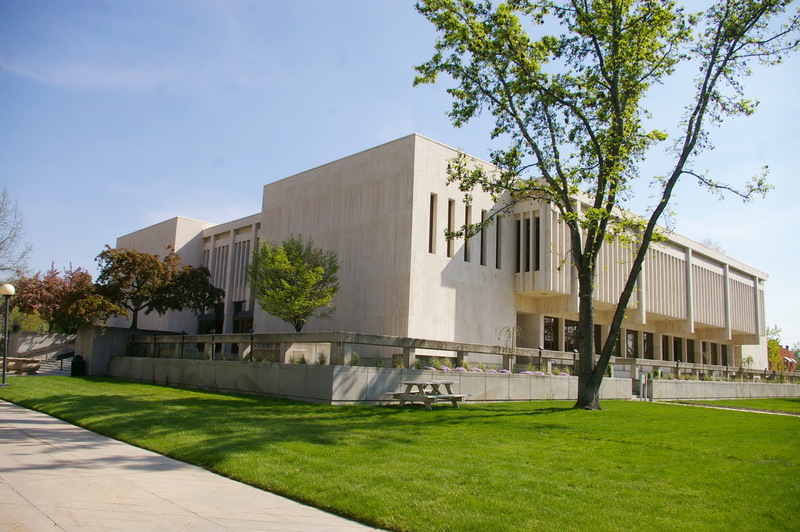 Another element to the Idaho Supreme Court building is Modern style architecture. In post-war America of the 1950s and 1960s, these modernist trends were not uncommon. These trends are shown through the presence of parts of the second floor overhanging the first, creating a sense that the second floor is extending much farther than the first. This also helps with the effects of the vertical lines of the Art Deco style because it makes the vertical lines one the outer walls of the building more distinct and more eye catching, because they are being pushed out farther than the wall of the first floor in the form of inset and onset slotted bays. The architects also clearly envisioned an austere first floor cantilevered by a powerful second floor. 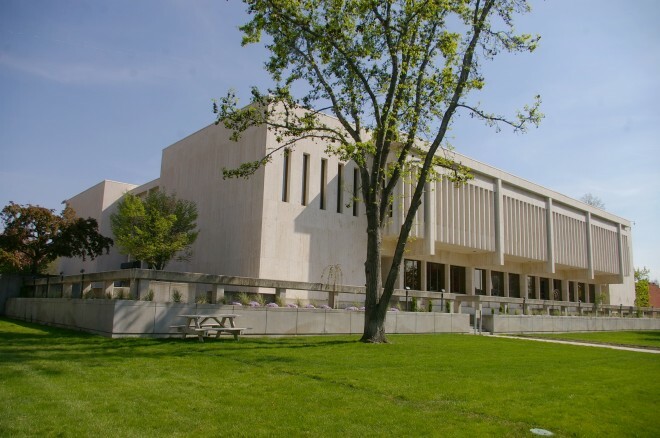 The Idaho Supreme Court has had numerous locations throughout its history as Idaho’s “court of last resort,” but none were as successful in promoting the vision of this foreboding yet crucial branch of Idaho’s government. Out of all additions to the Boise Capitol Mall district in the late 19th century, it is arguable that this magnificent piece of architecture is most significant: both in its simplistic, modern architectural beauty, and in its rich history of upholding the law.